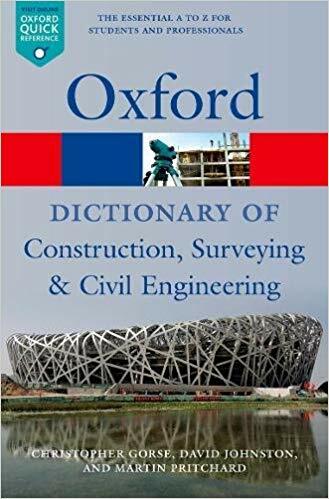 This Dictionary aims to provide a comprehensive and up-to-date reference of construction, surveying, and civil engineering terms within one publication. The entries address the needs of those studying on built environment courses or engaged in professional practice as well as providing much useful information for those with a general interest in architecture or construction. Builders, trade suppliers, and contractors will find the dictionary a useful desktop manual that can be easily and quickly used to check unfamiliar terminology. Due to the size and nature of the industry, it is difficult for even the most knowledgeable professionals to stay abreast of emerging issues and retain an encyclopedia of construction terms at the front of their mind. In such cases, the book acts as a reminder, giving reassurance of meanings and confidence in communication. Built environment professionals, including architects, building surveyors, building services engineers, construction managers, civil engineers, electrical engineers, facilities managers, mechanical engineers, and quantity surveyors should find the Dictionary useful. It offers a quick and easy guide to terms and information that underpin the environment in which we live, both built and natural. In covering these terms, the authors have delved into the areas of building physics and science, and their application to design, structures, materials, and practices that inform construction and engineering. Issues associated with geology, geography, climate, and the natural environment within which buildings and structures are accommodated are also covered. The policy and legal frameworks that provide governance and procedure to the built environment are included, as well as the issues related to the professional organizations that hold influential positions within the industry. with the built environment increases.